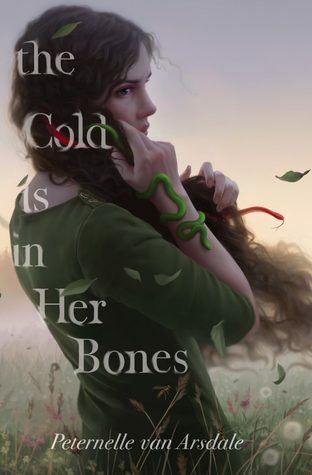 I requested an eArc of The Cold is in Her Bones from Netgalley. I heard some great things about it from my reading buddy Milana, so I was anxious to give it a try! Ultimately I am glad I did, and if you are a fan of witchy reads I would definitely recommend it. Milla knows two things to be true: Demons are real, and fear will keep her safe. Milla’s whole world is her family’s farm. She is never allowed to travel to the village and her only friend is her beloved older brother, Niklas. When a bright-eyed girl named Iris comes to stay, Milla hopes her loneliness might finally be coming to an end. But Iris has a secret she’s forbidden to share: The village is cursed by a demon who possesses girls at random, and the townspeople live in terror of who it will come for next. Now, it seems, the demon has come for Iris. When Iris is captured and imprisoned with other possessed girls, Milla leaves home to rescue her and break the curse forever. Her only company on the journey is a terrible new secret of her own: Milla is changing, too, and may soon be a demon herself. First thing’s first, this cover is so beautiful, I just want to dive in, and live in this meadow. I loved looking at the cover while reading the eArc, I kept it up on my computer while I read. It really captures the atmosphere and the vibe of the book so perfectly. Yes, this is a book about a girl with snakes in her hair, no she doesn’t turn people to stone. The traditional gorgon aspects of the story read a bit thin to me, but that may only be due to my limited knowledge of Medusa myths. There is certainly a great deal of metaphorical meat to this book, which I loved! One of my primary takeaways from The Cold is in Her Bones is the notion that what you put into the universe will return to you 3 fold. This is a common idea in many different belief systems/ cultures, and I felt that it informed a lot of the plot and character’s choices in this book. Watching those karmic actions and reactions play out was really compelling, and made me root for the main character, Milla. She really was trying her best most of the time, and I just wanted to see her get some happiness. One of the other interesting themes in the book is how we inherit prejudice. Many characters are outcast for exhibiting behaviors deemed inappropriate, or abnormal. The main driving force of the book is a curse brought on by ignorance and intolerance. It serves as an indictment of how we can mistreat people we don’t understand. It’s also a powerful call back to the Witch Trials, where men and women were put on trial for virtually any reason their neighbors could invent. There are so many other important questions raised by the book. One of the most interesting to me is when the desire for justice crosses the line into indiscriminate vengeance. This is something I would love to talk to more readers about after the book hits shelves on January 22nd! If you already read the book, let me know your thoughts in the comments. It was way more witchy than I anticipated! Which was awesome, loved it. Yes the 3 fold! I think that might be why I like things in 3’s I’m really glad you liked it!